It’s time to step into the light! We all use lights quite a lot. They are almost miraculous in how they enhance the quality of our lives and our ability to be productive, particularly in winter. All light bulbs generate convert electricity to light. The way that this conversion is done however, has a massive impact on how much electricity they consume, and how much they cost you. 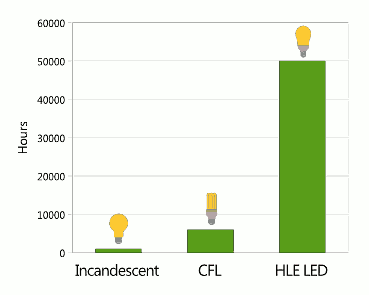 Here’s an all up energy consumption comparison between the three main types of bulb: incandescent (bad), CFL (a stop gap until LEDs came along) and LED (good). 2012<http://www.irishexaminer.com/ireland/lights-out-for-old-style-edison-bulb-on-saturday-205700.html> ) in Ireland and across the EU as of September 2012. LEDs don’t involve converting electricity to heat to light, so last hundreds of times longer. Watching my energy monitor, I started replacing incandescent GU10 light bulbs in a light rig in my kitchen one by one to measure the reduction in consumption. Each incandescent consumed just under 41 watts. 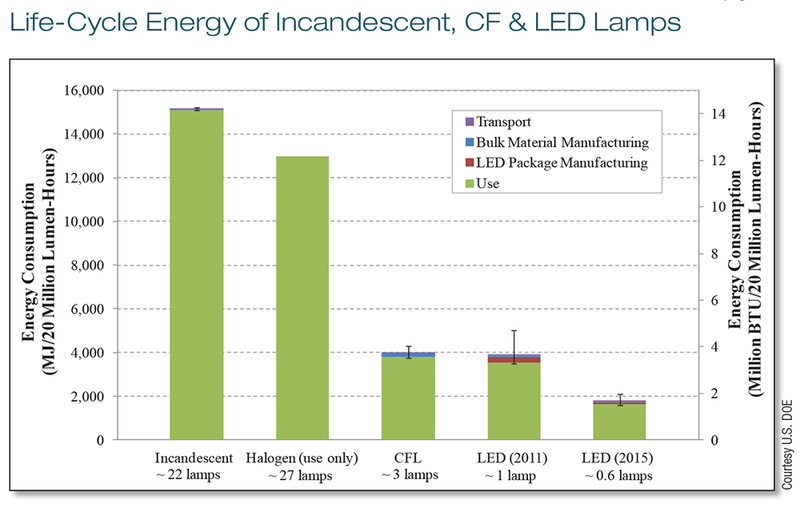 Each LED consumes 4.5 watts. There are four bulbs in the rig, so after fitting the LEDs: 163 watts reduced to 18 watts. That’s a 145 watt reduction. These lights are on for about 1.5 hours per day –> 145 watts * 2 light rigs * 1.5 hours a day = 435 Watt hours per day. 435 *365 days a year = 158,775 /1000 = 158.775 kWk per year. To quickly work out the emissions savings: Ireland’s CO2 intensity is 535g CO2 per kWh. .535 * 159 = 85.065 kg CO2. Changing 8 light bulbs in my kitchen will avert 85kg of CO2 a year. So all in, that’s a saving of 159 kWh per year. At the electricity price of €.17 / kWh, that means a financial saving of€27.01 per year. The 8 LEDs cost €22, so the payback is €22 / €27.01 = 0.81 years. So they pay for themselves in under a year. I repeated this for the whole house, and the savings come to 495.165 kWh per year | €87.29 per year | 274.8697 Kg CO2 per year. Time to complete the change: 2 hours to shop for the LED bulbs on DX.com and 2 hours to replace all the bulbs in the house while watching the energy consumption drop on the energy monitor. What LEDs should I buy? 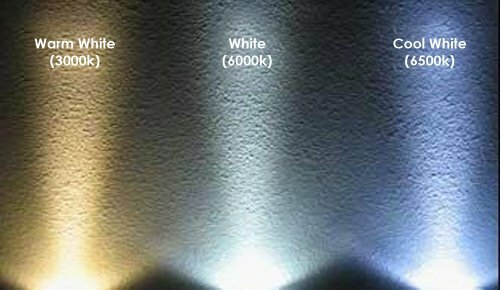 The full LED Colour Temperature Range. 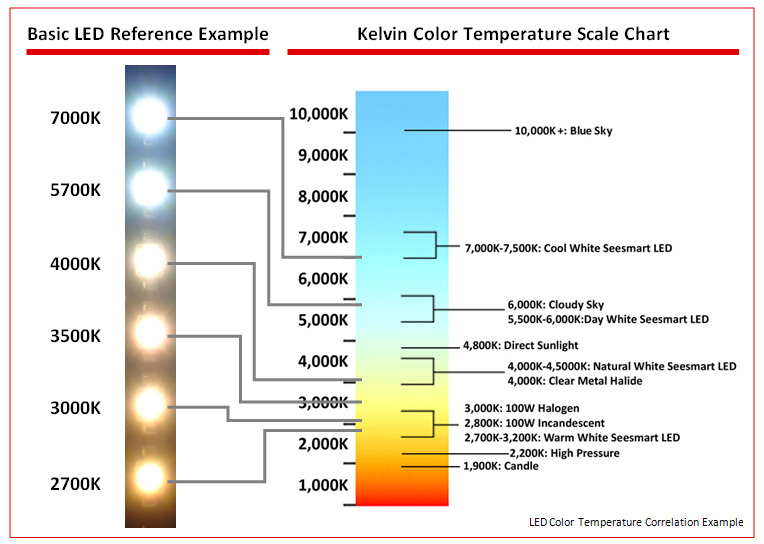 When buying LEDs, just look for the light colour temperature you want on this chart (measured in Kelvin). So this completes step 2 of our journey to energy freedom – cutting all energy costs from our lives. I managed to upgrade the recessed downlighters in the living room with Ikea LEDs no problem (E15 fittings). They don’t do bayonet LEDs though, so I’d to buy an adapter for the other bulbs. I also have a series of fittings that use three to five bulbs each, so instead of just buying a new bulb, I’m now swapping out seven light fixtures to accommodate the new bulbs (one bulb per fixture, thank you!) Realistically I’ll do three downstairs now and save the upstairs ones for a pending remodel.